Who do I contact with questions regarding an auction or item? Each auction on K-BID.com is managed by a member of our independent affiliate network. Each auction has a different location, terms and contact information. This information can be found within each auction and item page and should be verified prior to bidding. Forgot password, or having trouble logging in? You can login with either your bidder number or the email address used to register the account. Be sure to check your spam or junk folder if you are not receiving the password reset email. K-BID reserves the right to remove bidding privileges for any user violating K-BID site terms or auction specific terms. Check the Your Invoices section of your dashboard. If an invoice has been marked as No-Show, contact the affiliate to make arrangements to pay the invoice and take possession of the assets. If the items are no longer available, it may be possible to have your bidding privileges reinstated after paying a reinstatement fee. Please inquire about this possibility by filling out the form below. In the event that bidding rights are terminated due to no-show invoices, bidders MAY be reinstated at the discretion of K-BID only after a penalty fee of $25.00 plus 20% of the unpaid invoice(s) has been paid to K-BID and a scanned copy of your driver's license emailed to us. INVOICED ITEMS WILL NOT BE AWARDED. The payment is punitive and meant to deter no-shows. 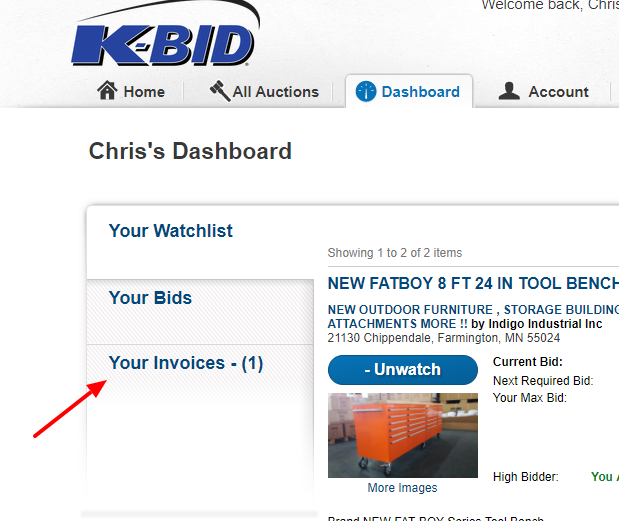 Prompt payment during the scheduled removal days and complying with auction terms and conditions is required to remain an active user on K-BID.com. If you believe that your bidding has been disabled in error, please contact us using the form below. Can I remove or retract a bid? We do not remove bids. It is extremely important that you verify bids prior to placing them. How do I sell on K-BID? Independent affiliates manage each auction that is listed on K-BID. Individuals and businesses will work directly with an independent affiliate to sell their assets. Please see this page for more information about selling on K-BID. How do I become an independent affiliate? I won an item! Now what? So you won an item(s), that's great! So now what can you expect? Winning bidder invoices will be updated to your dashboard within 10 minutes of the auction closing. Here you can view and download your winning bidder invoice. It is recommended that you print your invoice off as it will include pertinent location and contact information. IMPORTANT: Winning bidder notifications are emailed after each auction. However, some email services can be unreliable and put these message into a Junk or Spam folder. Always check your Dashboard for a winning bidder invoice if you have been actively bidding on an auction. Location: Look for directional signs around the auction location and double check the auction location prior to leaving. Call the managing affiliate if you have issues finding the location. Removal: This is the time you are expected to pay for and pick up the items. This is found on the bottom of each auction page and on your invoice. Removal dates vary for each auction so verify prior to bidding. Payment Types Accepted: Check the auction terms to verify the payment types that the affiliate will accept. Cash and Credit Card are almost always accepted. Checks, Wire Transfers and other payment types will vary by affiliate. Payment is due to the affiliate managing the auction. Contact Information: Contact the affiliate managing the auction if you have specific questions. Phone numbers located within the auction page and on your invoice. Shipping: If you require shipping and the auction provides it, follow the instructions on the shipping tab of the auction. Be sure to call the contact number on your invoice if you have specific questions about the removal or shipping. Late Removals: Never assume that late removals are possible. Most auctions have strict timelines that do not allow removals beyond the posted dates.. Please be sure to follow the terms of the auction to keep your bidding account in good standing on K-BID.com. If in doubt, contact the affiliate managing the auction to clarify. Click here if you have questions on how to read your invoice. Can I have an item shipped? Many independent affiliates offer shipping options to winning bidders. Be sure to verify shipping availability prior to bidding by navigating to the shipping tab on the bottom of the auction page. Due to the nature of some auctions, shipping can be difficult and will have an additional cost. It is common to be charged a handling/packaging fee in addition to the actual shipping charges. If you have questions or need clarification on options and pricing, please contact the managing affiliate by calling the phone number listed in the auction. Click here if you have other questions on shipping. Do you have more FAQ’s? Click here if you have other questions. K-BID uses a ticketing system to ensure bidder questions and issues are tracked and responded to in a timely manner. Please submit the following form if you cannot find an answer to your question in the Bidder Knowledge Base or if you are having trouble contacting an affiliate.